Chef Nathan Eades formerly Sous-Chef at three AA rosette awarded Fishmore Hall in Ludlow, has been running pop-up Epi Restaurant at The Courtyard Café in Bromsgrove since 2013. Given its success there it’s only natural that Nathan should seek bigger things, and sure enough he’s chosen Birmingham to expand to. Thus we attended the first of Epi Restaurant pop-up nights at The Kitchen Garden in King’s Heath, on a bleak January Monday night. The venue is not a fine dining establishment. It’s more of a hodgepodge of kitchen, conservatory, and shed. It’s a popular venue for random music events, and I can see that live music would work well there. Nathan wondering around in his chef’s whites did look a little out of place though, and I was apprehensive about what exactly we’d let ourselves in for with a wobbly table and imperfect service. It really was quite random, not least because we had to enter via another venue down the street. 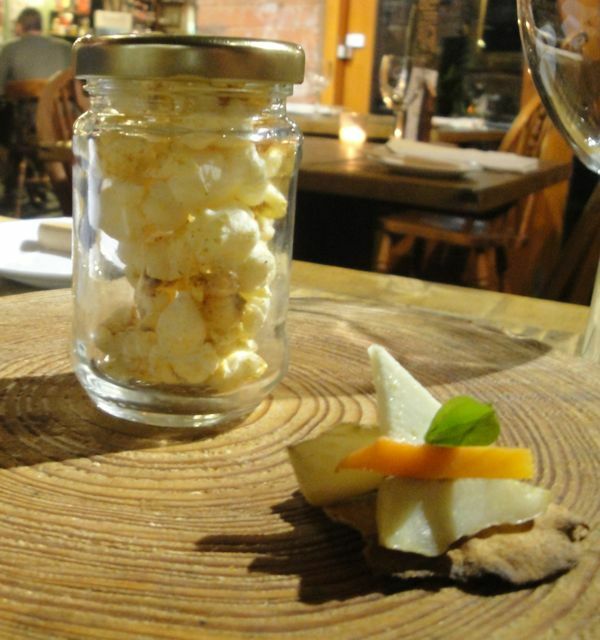 The format for the evening is a fixed menu for £32.50, and dinner started with a canapé cracker of Shropshire goats cheese with foraged sorrel, and some curried popcorn. I’ve never understood popcorn but the other half liked it, and I thought the cheese was good, and what’s not to like about hand foraged herbage. While we were nibbling on those we realised it was foodie central, bumping in to Dr. Roz the Foodie, Dine Birmingham, and the Doyen of Brum grub Paul Fulford from the Birmingham Mail – we were in good epicurean company it appeared! The first course was “Lamb, Shallot, Walnut”. 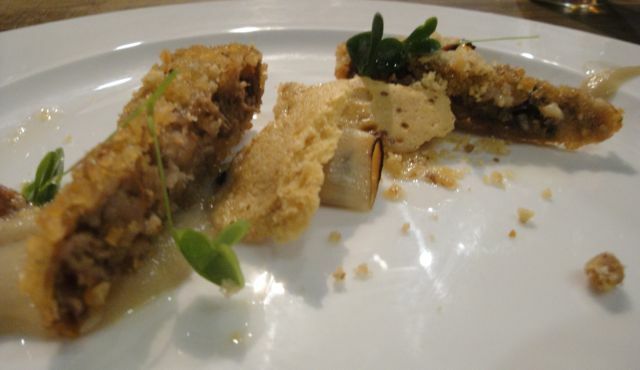 Rectangles of slow cooked mildly spiced lamb fried in panko crumb was cut diagonally and arranged on shallots three ways, walnut crumble and walnut oil. Sweet onion and lamb is a classic combination and I enjoyed it. The crumble wasn’t as walnutty as I expected it to be but I liked the dish, so a good start to dinner, we thought. Next course was simply called “Fish & Chips”. Given it was on the menu in speech marks it couldn’t of course have appeared as chip shop fayre, and we weren’t disappointed. 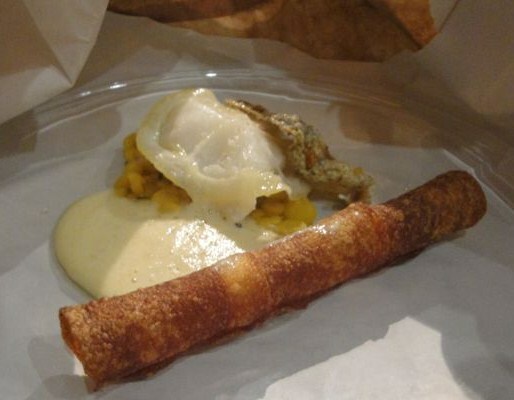 Paper wrapped glass plates held well cooked Hake with a mouthwatering thin slice of preserved lemon, crispy fish skin, clever tubes of fried potato, and curried split peas. That’s fish, chips, and peas, if you’d not made the mental leap. The flavours worked well together, and the food had good texture, my only criticism would be it was a bit colourless overall as a plate of food. The next plate was veritably verdant with green broccoli and purée served alongside succulent pork fillets with apple slices and a crumbed fried cube of other piggy things. The cube wasn’t quite crisp enough for me, but it certainly tasted of oink. 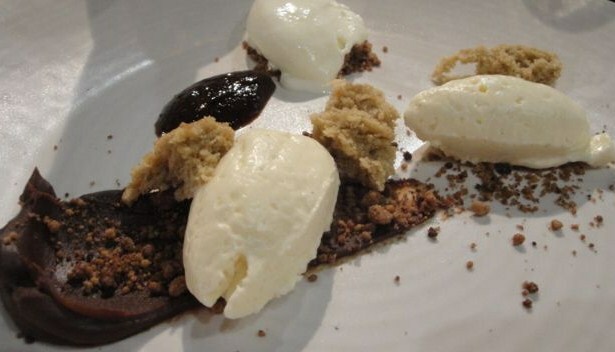 Served for the final course of the night was a de-constructed Tiramisu with microwave hazelnut sponge. A shot of reduced espresso was on the plate that was ultra bitter, but with the chocolate and sweetness of the ice cream, it calmed down somewhat and I really enjoyed the dish. Now the service may not have been perfect, but bearing in mind the venue it was taking place in, the lack of a full kitchen for chef to work in, and the fact it was the first pop-up there I think it was a really strong start to Epi Restaurant in Birmingham. Nathan is passionate about his food and showed some good technical skill as well as flavour pairings. I look forward to eating his food again, no doubt soon in his own restaurant rather than a pop up. He’s ambitious, and definitely one to watch. You can attend his Bromsgrove pop-up every Thursday, Friday, and Saturday until 29th March ’14, or his King’s Heath pop-up on 25th February or 31st March. For details check out the website here: http://www.epirestaurant.co.uk/ Also, probably worth following @RestaurantEpi on twitter to see whether he’s popping up at any other venues *nudge wink*. 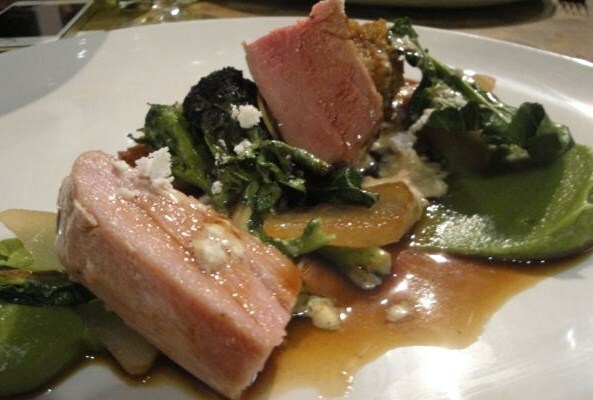 This entry was posted in Area: Kings Heath, Cuisine: English, Cuisine: Fine Dining, Cuisine: Modern Mixed, Price: Average, Venue type: Restaurant and tagged Birmingham Restaurant, birmingham restaurant review, birmingham review, eating out in birmingham, Out In Birmingham, out in brum, OutInBrum, restaurant review, where to eat in birmingham, Where To Go In Birmingham. Bookmark the permalink.